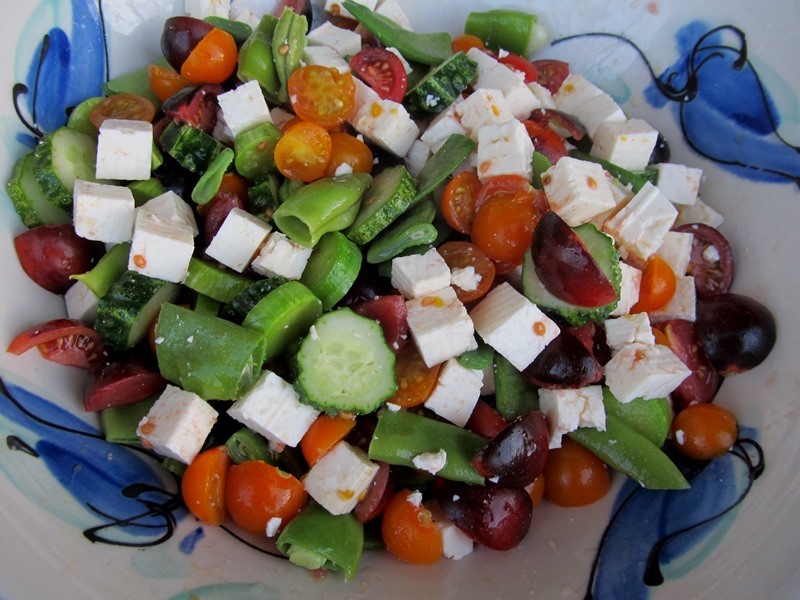 For over a month I’ve been enjoying my favorite summer dish, a tomato, cucumber and feta cheese salad. This year I’ve had more of these than usual, given the productivity of my tomatoes and cucumber. My Sungold and Indigo tomatoes have produced hundreds of tomatoes, enough for salads, sharing and dehydrating. 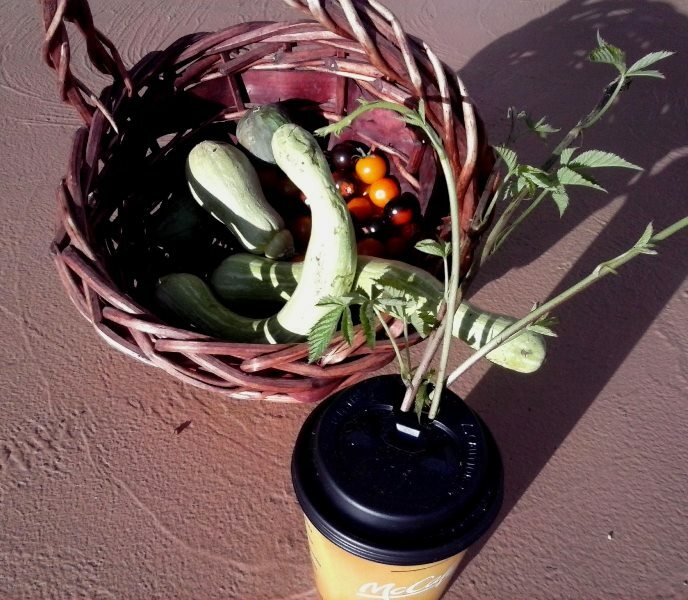 Of course, in addition to tomatoes and cucumbers, I like to throw in whatever else I can from the garden. I forgot to put in some celery, but did include my favorite summer squash, trombetta, and a new string bean, Musica Romana. All in all, combined with some whole grain bread, this provides a delicious meal. I should add that if you’ve never tried a homegrown cucumber, particularly an English or Persian style cuc, they are nothing like store bought. They lack the unappealing paraffin coating, are crisp and crunchy, and have a good cucumber taste. Grow some, or hie thee to a farmers’ market and buy some. I’ve got a medium sized crop of tomatoes this year. Some varieties haven’t done much, like the Green Zebras in the photo, but others have been prolific, like the dark red Indigos in the photo. Of course, the bright orange and sweet garden-candy Sungolds, are tasty and prolific as usual. The yellow ones are Yellow Mortgage Lifters. 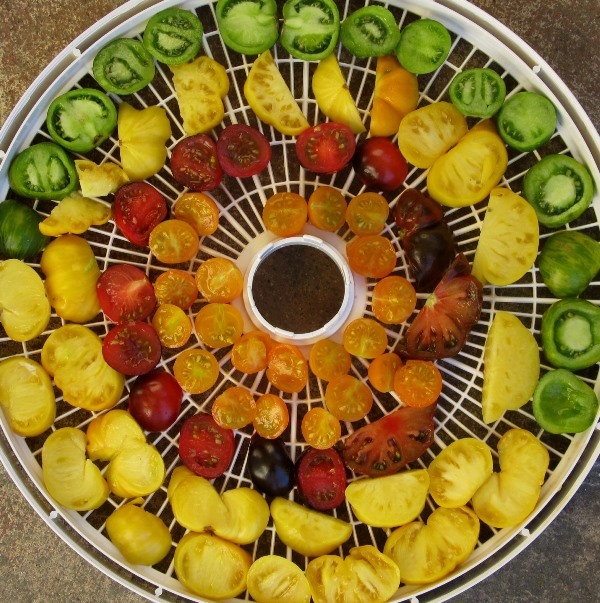 This photo is of one tray of tomatoes about to be started in the dehydrator. It’s nice to dry any surplus tomatoes I have, because I love having dried tomatoes during the winter. My favorite way to use them is in soups. I simply grab a couple of handfuls of dried tomatoes and throw them in a kettle of water. They soften up and the water leeches out a nice tomato flavor for the broth. Then I throw in whatever else I want, often string beans and summer squash from the freezer. 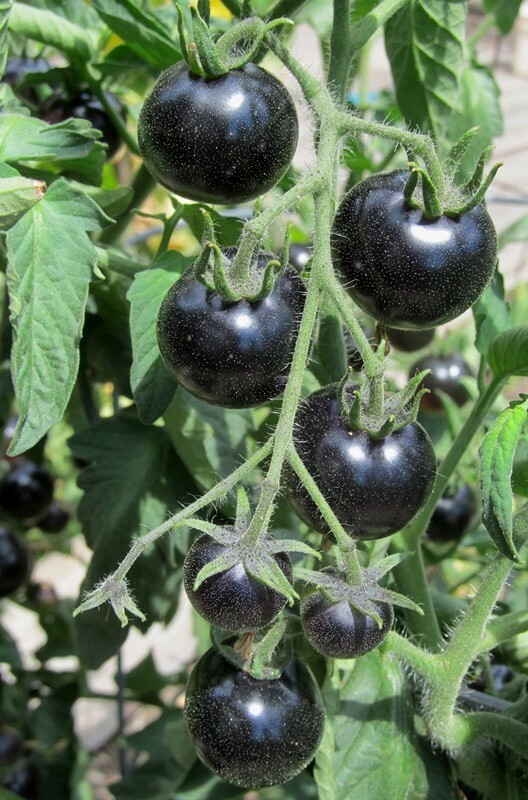 I was tempted this spring by the name of a tomato I hadn’t grown before: Indigo. I was curious what these would look like. The plant produced fruit very early this summer, but the fruit are only ripening now. This looks to be a good variety, as it is productive, tasty and pretty. 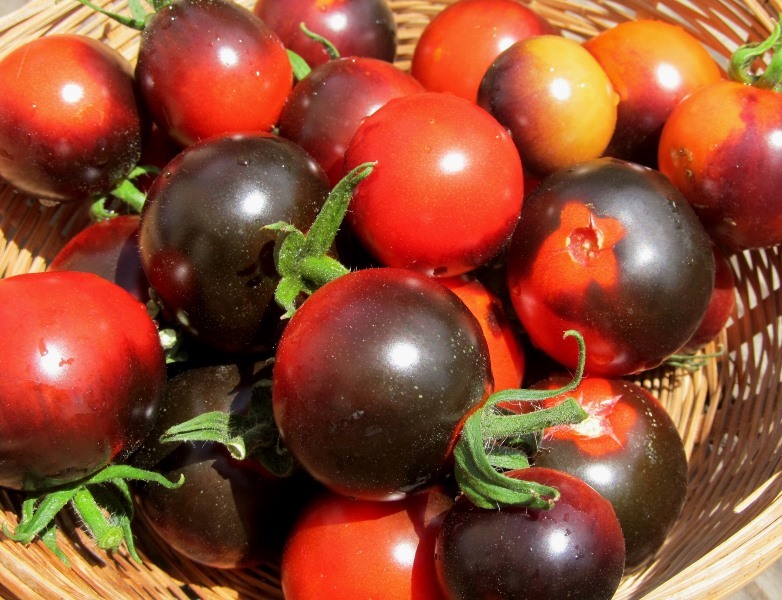 On the vine, before the bottoms ripen and turn red, they are almost black in color. I’ve been experimenting with growing a few dry beans in the past couple of years, but this year decided to ramp it up and grow more beans and more varieties. Today, I picked about half of my crop and shelled them. Although they look like something from the Jelly Belly factory, they’re not jelly beans. 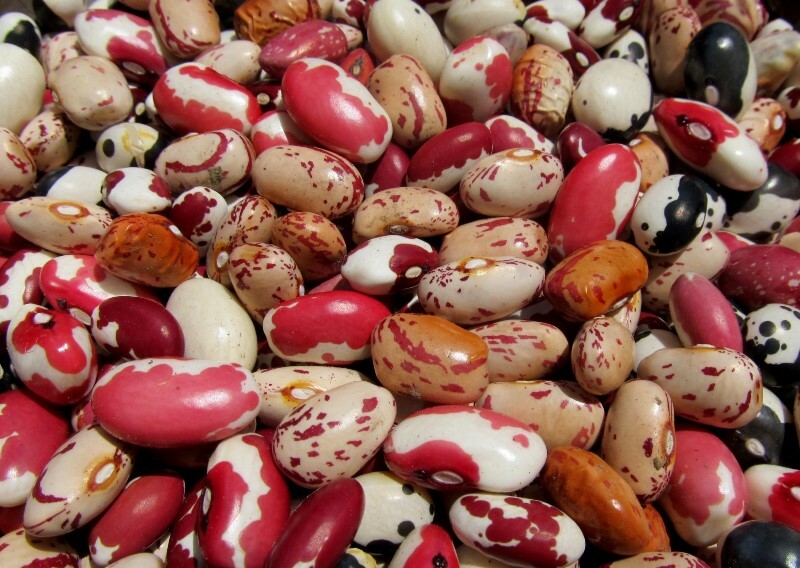 I just like beans that look interesting. I’m still not growing enough to provide a lot of protein, but it is a worthwhile experiment. Most gardeners grow only fruits and vegetables that don’t provide a lot of protein. So, this is one way to get some protein from my garden. 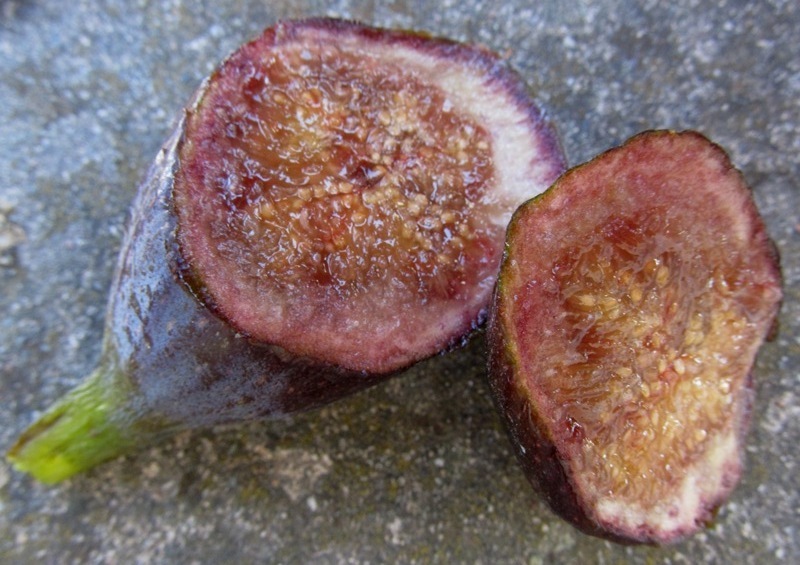 This morning I was excited to harvest my first fig of the season, and it was tasty! I then started my regular pass through the garden, harvesting what’s available today. 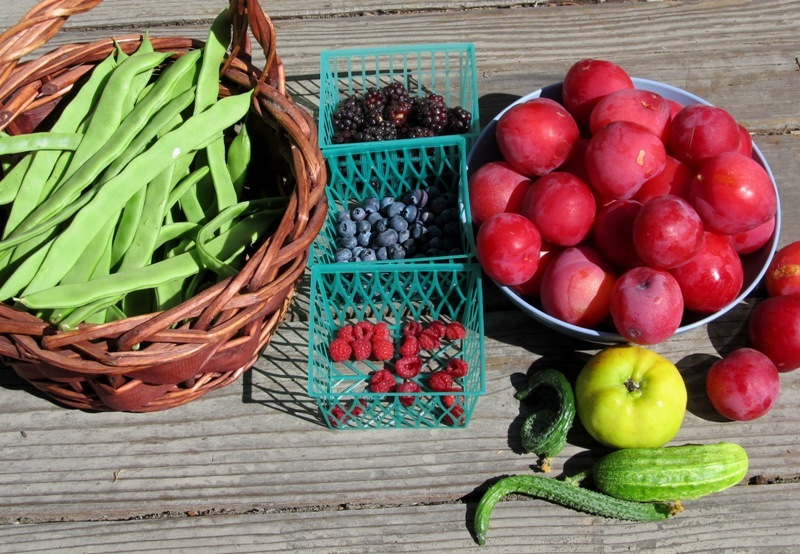 My two BIG items for the day are my string beans and my plums. The string beans are a new variety for me, a musica romana. These beans are huge! And the plants (about eight) are very productive. Since this is just the beginning of their harvest, I’ll have to make room in the freezer for lots of them. They provide a nice addition to my winter soups. June begins my summer harvesting season, with berries and stone fruit in abundance. This was my harvest one day about a week ago–mostly blackberries, some raspberries and a few apriums. 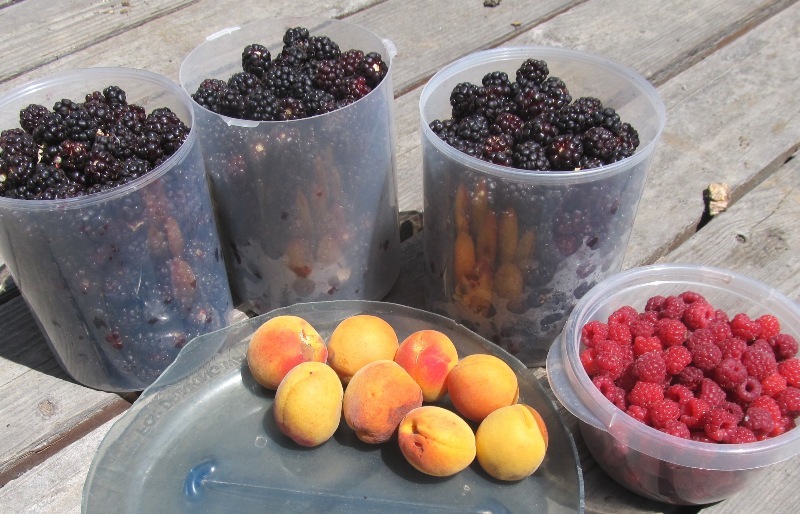 The blackberries and raspberries are slowing down now, but the apriums and apricots are in full harvest. I started harvesting my blueberries about a week ago and they are just starting to produce in quantity. In about a week my plums will be coming in. My figs, grapes and apples are other perennials well on their way, too. My annual crops are already starting to come in. I picked a cucumber a few days ago, and I’ve got two kinds of summer squash that I’ll start to pick in a few days. This is the best part of the year, with all these fresh fruits and vegetables to eat, preserve and share. Life is good as an urban farmer.